LinkedIn embraced video for the first time last year by allowing users to post native videos. Now it has gone a step, in fact, two steps further. 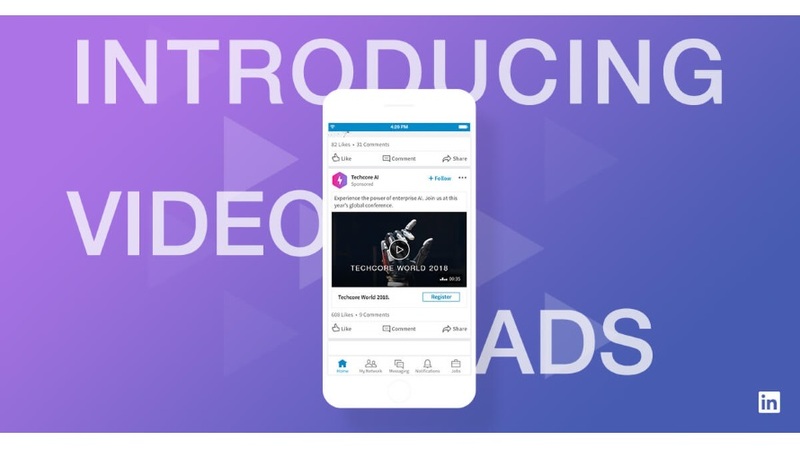 The B2B platform has launched two updates that will allow in-feed video ads and video on company pages. LinkedIn says nearly half of B2B advertisers surveyed by it said one of their top challenges was finding the right environment in which to run video campaigns. LinkedIn believes it is the answer as it tries to head off competition from other platforms, such as Facebook, who are trying to muscle into the B2B space. Even though their native video capability was only launched last year, according to LinkedIn’s Peter Roybal when people watch a video on the platform they are 20 times more likely to share it than any other type of post. I can’t help thinking this is excellent timing from LinkedIn. If you are anything like you me, you are suffering from GDPR opt-in fatigue as businesses race to make their email lists compliant before the May deadline. There’s no doubt the new GDPR rules are going to have a negative impact on B2B email video marketing. For many businesses, LinkedIn will be an indispensable alternative. LinkedIn sees video ads as an evolution of their sponsored content. Video for Sponsored Content (as they are calling it) sits on news feeds as a standalone post. This can be used to build brand awareness, collect high-quality leads and drive qualified traffic to your website. A defined audience by reference to job title, company name, seniority, skills, etc. Specific accounts using account based marketing campaigns. LinkedIn has high hopes for the new service and says data from beta trials of 700 advertisers shows that members spend three times more time watching video ads compared to static sponsored content. This is all well and good, but the key is whether it delivers greater ROI. LinkedIn believes its integrated Conversion Tracking tool gives advertisers the metrics they need to find out, such as leads, website visits, and detail about the types of people watching and engaging with the content. This covers much of what we talk about in our White Paper, and the importance of having video content for each step of the sales funnel. Data from LinkedIn’s beta programme shows that video on a company page is five times more likely than other content to start a conversation between members. LinkedIn started as a recruitment website and I believe videos showing a company’s culture and values will be especially effective on the platform. To discuss using video on LinkedIn for your B2B marketing, contact us now. Whilst success tends to be subjective, I’ve long believed that the businesses which excel tend to be those with the most compelling story. In many cases, it is this same story which binds a business to its audience that sets them apart from their competition. It is this essence of ‘brand‘ which keeps customers returning and defines successful content. Depending on how long you have been in business, the means by which you convey your story may have changed. Where once the Yellow Pages was the go-to destination for reaching your audience; social media and search have all but transformed how content is found. Whilst TV remains a primary channel, the prescriptive schedules of the traditional broadcasters have been disrupted by both a technological and a social layer. The technology is always-on and constantly connected whilst the social layer attempts to infuse a sense of community into the connected experience. Collectively, over-the-top platforms (OTT) such as the Chromecast, Amazon Firestick or the AppleTV run many of the channels we find on our mobile devices i.e, Facebook, YouTube, Netflix, Amazon Prime etc. This means that the sit-back experience of the living room has become an organic extension of our mobile lives and vice-versa. So, why is Social, the Open Web and OTT so important? Because the customer is ageing. It should come as no surprise that millennials have arrived in positions of influence within the enterprise and millennials inhabit the social layer like no other demographic in society. Successful content today will entice its audience to participate in its reach. If you look at how millennials engage with social media, it can be incredibly intimidating. There are multiple channels, speaking to different audiences with those users often rifling through their feeds at a pace which could be best compared to a treadmill for thumbs. Each moment is transitory and absolutely nothing feels permanent. Spotify owner Daniel Ek, recently proclaimed in a letter to investors that Spotify wasn’t in the music business, it is in the moments business. I get his logic but by that definition, we’re presumably all in the ‘moments’ business. The question remains, how do we enrich that moment so that our audience cares enough to be truly engaged. Successful content has to be powerful because online interactions need to stick almost immediately or risk not sticking at all. As it happens the channels have been giving us a clear indication of the direction of travel for some time and it’s fairly widely accepted now that video is the most effective medium for capturing and retaining attention in social. Even LinkedIn has finally caught on, adding video to both personal profiles as well as company pages. As business owners, it is our job to shape these conversations. To do that we have to be the creators of content which adds value and capitalises on the zeitgeist. Successful content is relevant, not spam. Not only that but we also have to do it with a certain level of scale because at the top of the funnel, our audience is only tapping into us for moments at a time. We need lots of moments with our prospect for them to begin to notice us, even more for them to get a sense of our offering. More still to turn them into fans. Is it any wonder that we’ve witnessed a content explosion over the last few years. Further down the funnel, the moments we share tend to be longer because the engaged prospect will want more from us. If you haven’t done so already, step back and ask yourself ‘What is the story of your business? Why should your prospect care?’ The successful businesses of tomorrow won’t just have a fantastic story but they will weave their audience into the narrative and make them feel part of it because after all, what is a brand without loyalty?